Auslogics Disk Defrag se encarga de poner orden a tus discos duros, volviendo a unir los fragmentos de archivo para que el sistema corra más rápido. Auslogics Disk Defrag ofrece análisis y desfragmentación, así como una opción para optimizar el disco y evitar que se desfragmente antes de tiempo. Otras funciones de Auslogics Disk Defrag son la desfragmentación en tiempo real, desfragmentación de archivos concretos y tareas programables para un día concreto. 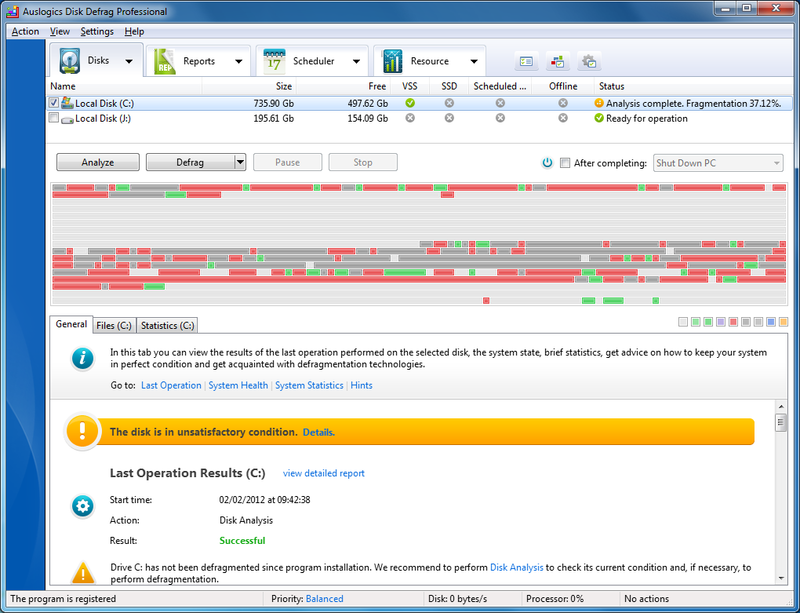 Auslogics Disk Defrag Professional Editon is of your favorite defragmenter. Now delivers even more speed to your hard drive, thanks to new optimization algorithms and boot-time defrag technology. Disk Defrag Pro increases file access speed, meaning that just about everything on your PC will work faster. Thanks to 4 different algorithms for intelligent file placement, your hard drive will always run at its top speed. Can’t decide which defrag algorithm to choose? No worries! Use the Wizard to identify best defrag methods for your PC. Disk Defrag Pro not only defrags, but also can prevent further fragmentation by leaving free space after specified files. For faster and safer defragmentation, you can set the program to remove temp files and check disks for errors. Limit the use of system resources by the defrag process when you’re at your PC, or lift any restrictions for faster defrag. Speed improvements and disks’ state can now be easily tracked through detailed reports and performance charts. Now you can defrag every single file, including crucial system files that are normally locked by Windows. 0 Response to "Auslogics Disk Defrag Pro 4.0.0.30 (NEW)"